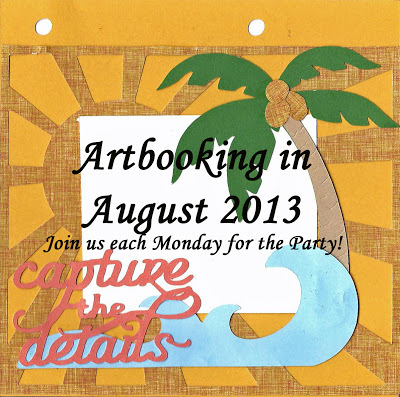 Welcome to Week 2 of the Artbooking in August Blog Hop! 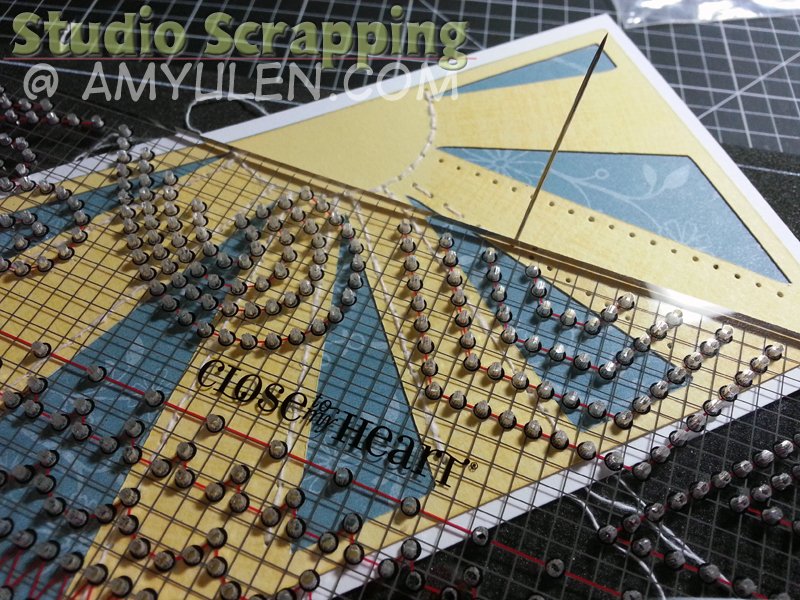 If you are joining me from the super talented Scrappin’ Katy, you are in the right spot. This week, 36 Close To My Heart Consultants are taking on the challenge to create a scrapbook layout, card, mini-album, or gift item using the new Artbooking Cricut Collection. I gave myself the added challenge to “shop my stash.” I put away all my new products and dug deep to come up with papers I haven’t used for years. They are so old, I can’t remember the name of the kit! That really is one of the things I love best about Artbooking, it is breathing life into papers I was getting ready to donate to my school. Of the 700 images on the Artbooking Cricut Collection, nearly 90 are full or half page overlays! 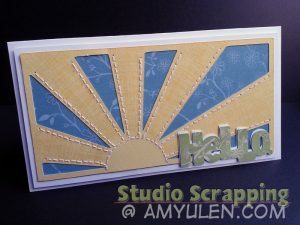 The overlays range from themed for holidays/seasons to geometric shapes used for everyday projects. 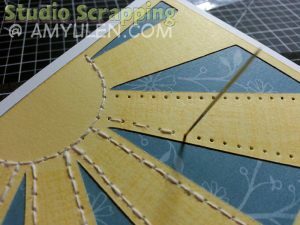 The Cricut book suggests that you cut the overlays at 11″ for a full page layout, but don’t forget that you can use the Real Dial Size to cut your overlays to fit your projects. That’s exactly what I did for this Hello card. 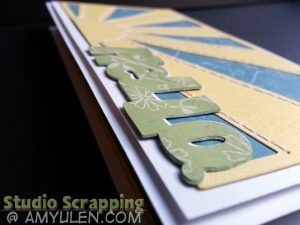 I designed my card in Cricut Craft Room, but you don’t need it to modify the size of your overlays. Simply hit the Real Dial Size button and set your dial to 3″. 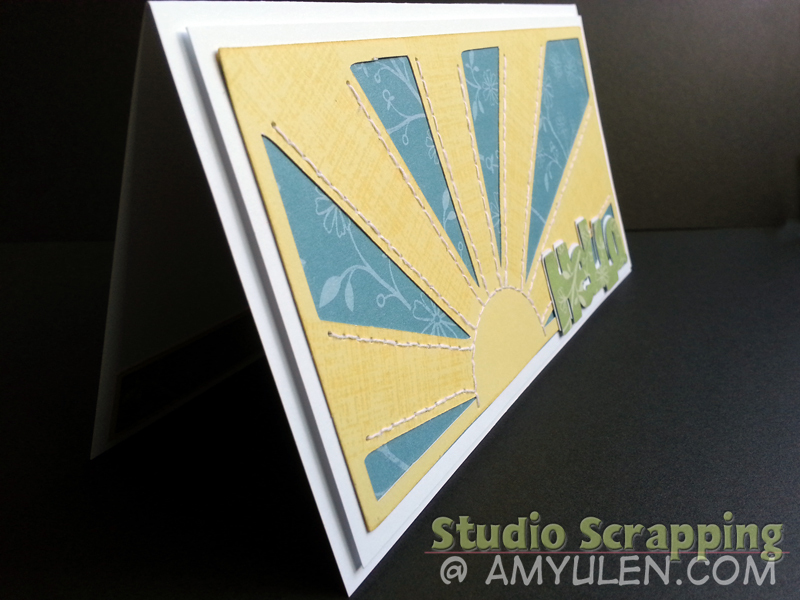 This will give you a 3″x6″ sunburst overlay to fit the front of your card. My final card measures 3.5″x6.5″. I placed the sunburst overlay onto a rectangle of blue patterned paper and mounted them both onto 3.25″x6.25″ White Daisy cardstock. I used foam tape to adhere it all to my card base. 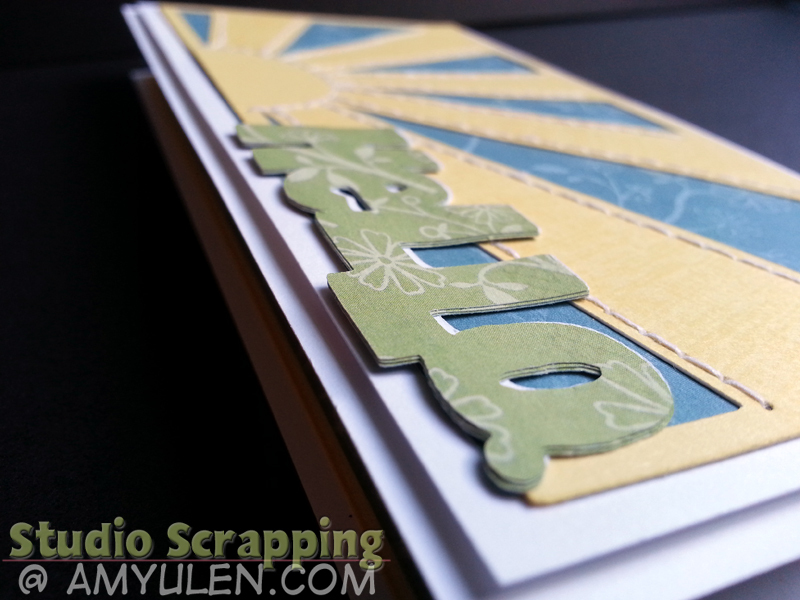 Since I used our older, lighter weight paper, I cut the sentiment several times to make the title stand out more. This experience reminds me that I really love the weight of our patterned paper! Whenever I cut overlays out of cardstock, I feel like they are a little flat. I want to add some dimension to the overlays through stamping or inking. In the case of the sunburst overlay (page 81), I added stamping using the Patterned Pennants (D1534) stamp set. 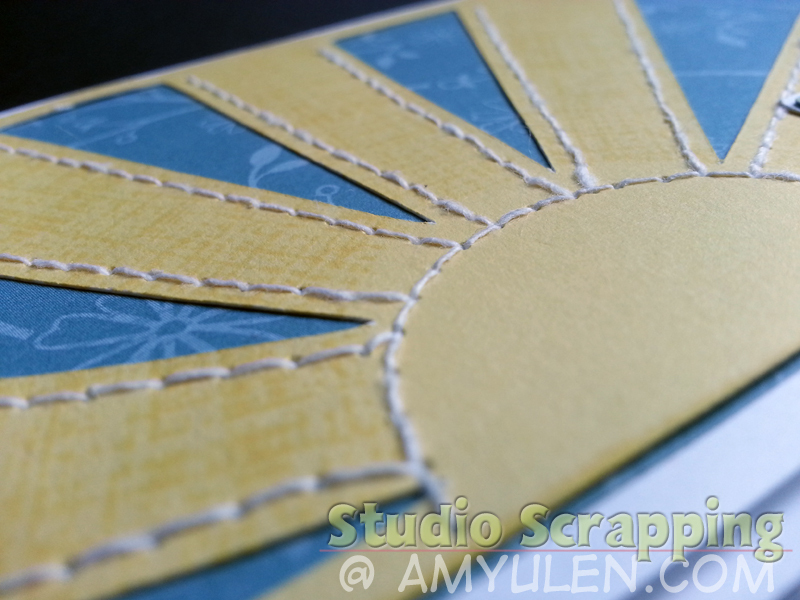 I masked the center of the sun and the border of the overlay so that only the rays of the sun were stamped. I love the contrast that this provides even though I stamped tone-on-tone with Buttercup ink. This stamp set also had the perfect sentiment to use with the overlay! 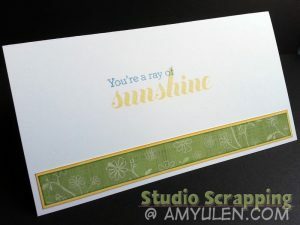 On my next card, I’m going to move the “You’re a ray of” to the left a bit so it doesn’t overlap the “sunshine.” But, frankly, I spent way too much time on this card to change it now! So, you may be asking, what took so much time? Hand stitching! Our new Stitch Guide (Z1852) made it really quick work of punching holes, and the new 15″ Foam Mat (Z1859) is amazing! Even so, stitching by hand takes time. It was totally worth it though, because I love the look of this card! Thank you so much for visiting my blog; please feel free to leave a comment and say “Hello”! 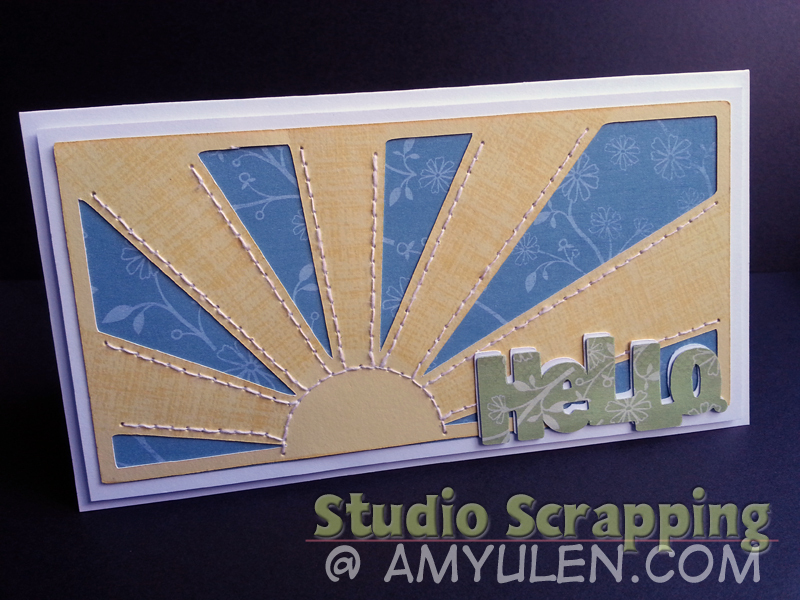 Then click on over to the start of our blog hop at Rebecca’s Stamp & Scrap Studio! If you get lost along the way, be sure to visit this link to see the entire list. Watch the following tutorial to learn 3 more techniques to add stitching to your projects in addition to hand stitching!